Norwich Farmshare is a community farm on the edge of Norwich, near Postwick. We help adults and children learn about the source of their food and train volunteers in practical growing skills. We grow food for over 80 members and deliver weekly around the city. We’d love to see you at our annual Open Day on Saturday 27th September 10-4.30. 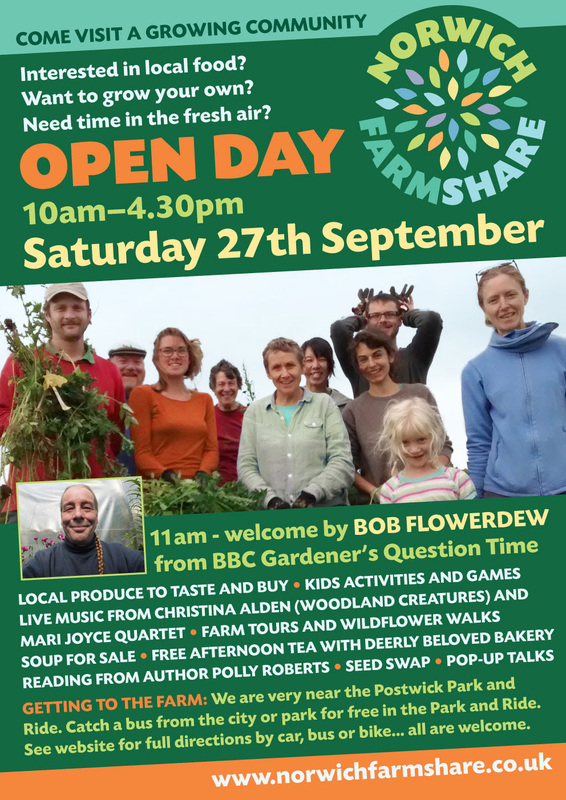 We will be welcoming Bob Flowerdew from BBC Gardener’s Question Time and there’ll be some great live music, kids activities, delicious food stalls, games and pop-up talks. We’ll be running farm tours and there’ll be a chance for all the family to get their hands in the soil! Come for the day or come for a while: all welcome.